On the 8th June 1913 an article written by “Hugh Kalyptus” appeared in the Sunday Times newspaper relating the story of the Roebourne bank murders. After only 28 years there were already some inaccuracies creeping into the story. 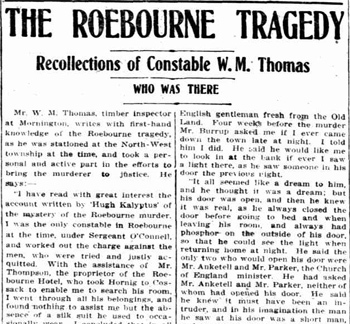 The article prompted former police constable William Thomas to put into print his recollections of the murders and this appeared in the same newspaper on the 6th July 1913. His is an illuminating eyewitness account of the scene immediately after the murders. We learn, for the first time, that there were two bloody left handprints left on Henry Burrup’s pillow slip and mattress. If this is indeed true, how strange that this was never mentioned anywhere in the police file, in earlier newspaper articles or during the murder trial. Is it an indication that the murderer was left handed? The “gentleman” Thomas refers to is Roderick McRae a best friend of Thomas Anketell. Who is the woman that accused McRae of being the murderer? It appears she is referred to by her ethnicity or job title i.e. “a ________ ” yet this is left as an underline in the article. Maybe “a native” or “washerwoman” etc. “I have read with great interest the account written by ‘Hugh Kalyptus’ of the mystery of the Roebourne murder. I was the only constable in Roebourne at the time, under Sergeant O’Connell, and worked out the charge against the men, who were tried and justly acquitted. With the assistance of Mr. Thompson, the proprietor of the Roebourne Hotel, who took Hornig to Cossack to enable me to search his room, I went through all his belongings and found nothing to assist me but the absence of a silk suit he used to occasionally wear. I concluded that in all probability it was in the silk suit that he did the-crime, and that it would have been saturated with blood as there were 12 wounds through “Anketell’s head. Dr. O’Meehan said anyone of the wounds would have killed him, with the exception of the one which broke his right jaw. Mr. Anketell’s bunch of keys I found lying on his chest These may have fallen from his hand as he fell on the verandah floor. When we had all the keys we at once proceeded to try and open the safe but could not do so. Many bystanders claimed to be able to open it, but, like the sergeant and I, were unsuccessful. Mr. Broadhurst, the former Union Bank accountant who did business for the bank at Cossack, was sent for. Mr. Broadhurst opened the safe, weighed the gold looked at the books and found all correct. The books were all posted to the night of the 12th. That was the night of the murder and Mr. Anketell’s first night in Roebourne after his return from a three weeks trip around the stations. Hornig, in my opinion, was waiting for that return. He often visited Mr Burrup, and exchanged books and they seemed to be on agreeable terms. Hornig was interesting. He had travelled a lot and had been 16 years in the back blocks, of Queensland. This kind of person, especially when well educated, was very interesting to a young English, gentleman fresh from the Old Land. Four weeks before the murder Mr. Burrup asked me if I ever came down the town late at night. I told him I did. He said he would like me to look in at the bank if ever I saw a light there, as he saw someone in his door the previous night. It all seemed like a dream to him, and he thought it was a dream; but his door was open, and then he knew it was real, as he always closed the door before going to bed and when leaving his room, and always had phosphor on the outside of his door so that he could see the light when returning home at night. He said the only two who would open his door were Mr. Anketell and Mr. Parker, the Church of England minister. He had asked Mr. Anketell and Mr. Parker, neither of whom had opened his. door. He said he knew it must have been an intruder, and in his imagination the man he saw at his door was a short man, and compared the height of him to a man we both knew. The gentleman referred to by Hugh Kalyptus and I were in the death chamber of Mr. Anketell. Tears rolled down his cheeks when he said, ‘Poor old Tom! My God, I never thought that this would be your end.’ Following these remarks, the only woman we could get to wash and dress the bodies was a _______ , and she said ‘In any other part of the world you would be the first to be arrested for this, as you were the last to see him last night and the first to see him this morning!’ We left the room out of respect to the unburied remains of one who only the day before was one of the world’s best men and the remark made by the woman above referred to was the cause of the death of an innocent man and one of Mr Anketell’s best friends.